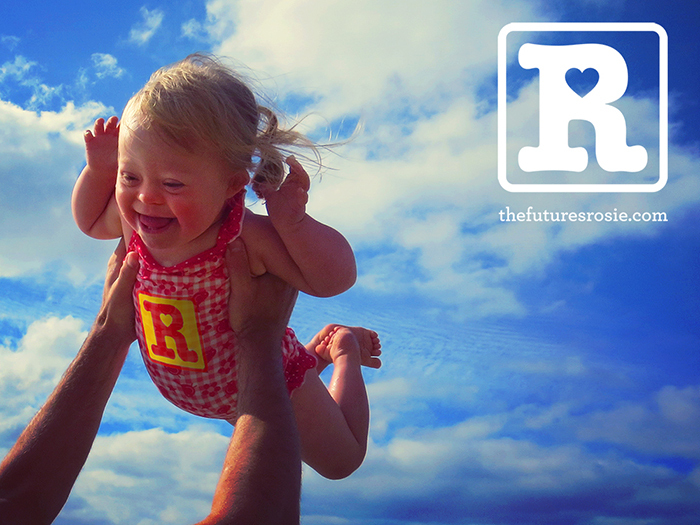 The Future's Rosie: Super Bud! Who is your real-life superhero? This is actually a tougher question than it would first appear, I'm inspired by people everywhere, so many of those are people with special educational needs, each one worthy of the title 'real life super hero' in my opinion. I especially get a lot of hope and inspiration from those who are further ahead in their wonderful life than my little Bud. One such person is Sarah Gordy, a professional actress who happens to have DS. Sarah is a great role-model and a true example of how a person with special educational needs can achieve success and independence, blowing away any ignorant pre-conceived ideas I might have had myself before Rosie was born. I was fortunate enough to meet up with Sarah. Like many, I've met or seen one or two famous people over the years but I can honestly say the first person to leave me genuinely start struck was Sarah. Her intelligence and charisma left me lost for words. We were at a private opening of a photography exhibition where I had a camera shoved in front of me and was asked to say a few words about the exhibits on display – rather embarrassingly I crumbled on the spot and was left standing there internally screaming for the world to swallow me up! Swiftly moving on the interviewer asked Sarah if she would mind saying a few words – I watched in total awe as she composed herself, stood in front of the camera and spoke so elegantly without a single drop of fear – putting my efforts to shame! This was a big moment that taught me a great deal about how I see people with Down's syndrome. As I think back to that evening, I realise that I just saw someone standing there doing a far better job of being put on the spot than myself - I didn't stop to think this was a young lady with Down's syndrome showing me how it's done. I thank Sarah for (unknowingly) giving me this important moment in my life which made me look beyond DS and truly see the person. Other heroes I see daily are all the wonderful adults with DS in full or part time paid jobs providing a genuine service to people and proving to any doubters their worth in society. There is also the fact that this little two year old (with her special powers of course) has managed to adjust my outlook on life and really changed the way I see the world - I've been around for 30 something years now and I'm almost sure she's the only person to have had such a major positive effect in such a short space of time. I've never been one for writing, in fact rarely do I even make time to read, but then you came along and brought out a side in me I never knew existed. Without your inspiration I would never have known this joy of being able to share my love and affection for something so pure, so innocent and so beautiful – that 'something' my dear is you. See I started writing my blog because the feelings I had when I first learned of your extra special chromosome were so very new to me, I felt a little bit frightened at times to be honest because I didn't really know anything about Down's syndrome and the special powers its given you. There were also feelings of overwhelming protection (those ones will never ever go away) and all this before I had even laid eyes on you. Then you came into my life and changed it forever and for the better too. I wanted to let others know how your extra little chromosome is nothing to be afraid of, how very precious you are, how you have this amazing ability to make everyone smile, how you have fulfilled (over and above) my dream of adding a daughter to our wonderful family. I consider myself a very lucky Daddy – so proud I am that I sit here writing my feelings down without being afraid to tell everyone, you may learn when you're older that it's not always the easiest thing for a man to do, but with you by my side I don't really worry about that anymore. You have taught me so much about myself, brought out a confidence in me that has been hiding away for years. I won't ever be able to thank you enough for all you have done for me, all that you have taught and continue to teach me, BUT I can promise to do everything within my ability to raise, protect and help you realise any dreams you may have for the future. You see Rosie, contrary to what some people may think or even sometimes say, you can (and most likely will) achieve anything you want to. Why not get involved by sharing your story on Twitter, post on Facebook, write a blog or post a photo, using #LDWeek13. What an awesome article! I LOVED it! You always do so well! Give her all our love from Utah!! That's a really lovely post from Rosie's daddy and its perfect for Learning Disability Week as it will show and remind everyone that there is so much to learn and enjoy through very special people! Thank you ! Wonderful, lovely, positive, true. Proud to know all the Rosie superheroes. I hadn't read your valentines letter before, beautiful words and completely agree about discovering a different side to yourself once your kids are born. Not sure when I wrote anything before Matilda was born.